Developing a client base on technology-driven service is a key part of Smart Buildings’ business strategy. The Hawk AX integration controller is an essential part of the leading-edge building-management systems their clients require if they are to achieve the desired operational effectiveness and efficiency. Mark Davenport, sales director, explains, ‘The ability to manage and deliver varied and advanced engineering projects on time is most important in building solid customer loyalty. ‘Independent system installers need to demonstrate a complete competency in all aspects of building-management systems (BMS) — from application and software engineering through to installation and commissioning. ‘Integration is the foundation of modern building automation. The role of the system installer now tends to be more focused on integration than control engineering. Manufacturers of original equipment increasingly install controls as standard, whereas previously controllers were supplied and programmed by the specialist control contractor. ‘Open protocols form the basis of seamless interoperability between plant and building sub-systems. The Niagara software-based Hawk AX is at the heart of the building-management solutions offered to our clients. ‘Lighting, building controls and metering utilise DALI, BACnet and M-Bus open protocols to enable communication and control at device and system level. The Niagara Framework software translates each protocol into a “common” language, enabling information to be exchanged and then transmitted back in the relevant protocol to a device or system. Smart Buildings’ customer base is primarily multi-branch locations where the requirement is for flexibility and usability founded on integration. The main client base is high-street banks, motor-vehicle showrooms and service centres. 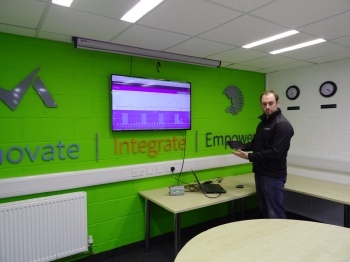 Tom Henderson, project manager for Smart Buildings, says, ‘The Hawk’s inbuilt graphics and integration capability has enabled Smart Buildings to develop its own dashboard template which we customise to suit our clients’ individual requirements. Mark Davenport adds, ‘We are proud of the contribution we are making to our customers’ businesses. ‘High-quality projects backed with dedicated maintenance and innovative support cements partnerships that form the basis of ongoing cost savings and operational improvement. ‘Our company’s values can be encapsulated in three key words. • Innovation: thinking beyond traditional values. • Integration: a holistic approach to combine and harmonise. • Empowerment: by simplifying the user’s experience. 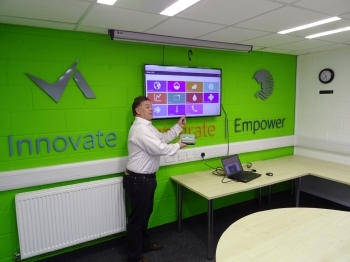 In action in Smart Buildings’ training room for clients specifiers and its own engineers, project manager Tom Henderson.